Apoptosis is a major form of cell death characterized by morphological features including chromatin condensation and fragmentation, cell membrane blebbing, and formation of apoptotic bodies. These morphological changes occur via signaling pathways that lead to the recruitment and activation of caspases, a family of cysteine-containing, aspartate-specific proteases. Caspases exist as inactive proenzymes in cells and are activated through their processing into two subunits in response to apoptotic stimulation. 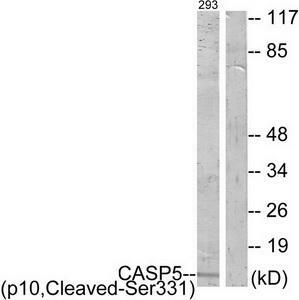 Activated caspases cleave a variety of important cellular proteins, other caspases, and Bcl-2 family members, leading to a commitm ent to cell death. Caspase-5 (also known as ICE rel -III or ICH-3) is a ~47 kDa member of the ICE/CED-3 family of cysteine proteases. 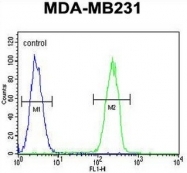 This protein has 51% sequence identity with human interleukin-1- β - converting enzyme, 27% sequence identity with ICH-1 L, 30% identity with human CPP32, and 24% sequence identity with the C. elegans CED-3 polypeptide. This ICE subfamily of caspase includes caspase-1, caspase-5, caspase-4, and caspase-13, and appears to play a primary role in cytokine maturation and inflammation. 1. Wang, S. et al. (1996) Identification and characterization of Ich-3, a member of the Interleukin-1beta converting enzyme (ICE)/Ced-3 family and an upstream regulator of ICE. J. Biol. Chem. 271: 20580-20587. CASP5 gene by Lipopolysaccharide and Interferon-gamma. J. Biol. Chem. 275: 39920-39926. 3. Munday, N.A. et al. (1995) Molecular cloning and pro-apoptotic activity of ICErelII and ICErelIII, members of the ICE/CED-3 family of cysteine proteases. J. Biol. Chem. 270: 15870-15876. 4. Cohen, G.M. (1997) Caspases: the executioners of apoptosis. Biochem. J. 326: 1-16. 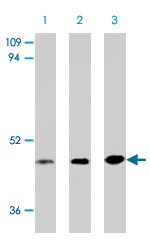 CASP5 polyclonal antibody (A01), Lot # 060608JCS1 Western Blot analysis of CASP5 expression in U-2 OS ( Cat # L022V1 ). Figure 1. Formalin-Fixed Paraffin-Embedded (FFPE) on Brain, cerebellum. 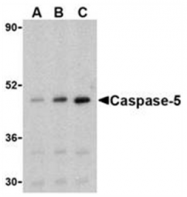 Western blot analysis of CASP5 expression in rat kidney tissue lysate. Western blot analysis of CASP5 in Ramos cells with CASP5 polyclonal antibody ( Cat # PAB9826 ) at ( A ) 0.5, ( B ) 1, and ( C ) 2 µg/ml. Western blot analysis of CASP5 in Ramos cells with CASP5 polyclonal antibody at ( A ) 0.5, ( B ) 1, and ( C ) 2 µg/ml. 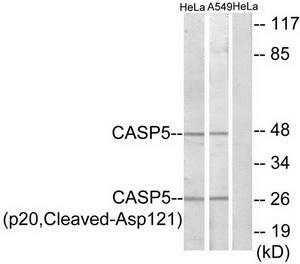 Western blot analysis of extracts from HeLa/A549 cells, treated with etoposide 25uM 24h, using Caspase 5 (p20,Cleaved-Asp121) Antibody. The lane on the right is treated with the synthesized peptide. 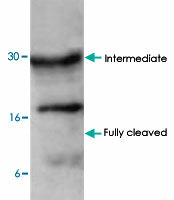 Western blot analysis of extracts from 293 cells, treated with etoposide 25uM 1h, using Caspase 5 (p10,Cleaved-Ser331) Antibody. The lane on the right is treated with the synthesized peptide. 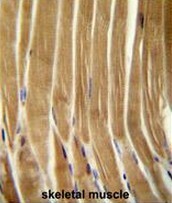 CASP5 Antibody (Center) (Cat. #AP50734PU-N) immunohistochemistry analysis in formalin fixed and paraffin embedded human skeletal muscle followed by peroxidase conjugation of the secondary antibody and DAB staining. 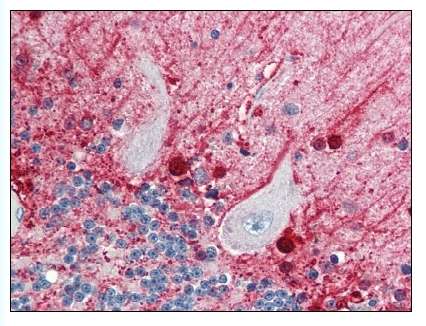 This data demonstrates the use of the CASP5 Antibody (Center) for immunohistochemistry. Clinical relevance has not been evaluated. 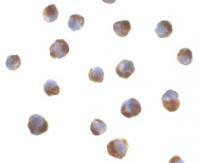 CASP5 Antibody (Center) (Cat. 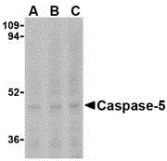 #AP50734PU-N) western blot analysis in MDA-MB231 cell line lysates (35µg/lane).This demonstrates the CASP5 antibody detected the CASP5 protein (arrow). 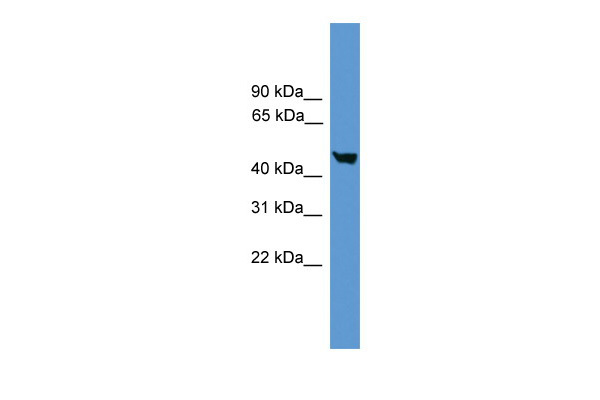 CASP5 Antibody (Center) (Cat. 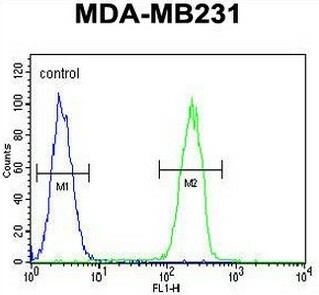 #AP50734PU-N) flow cytometric analysis of MDA-MB231 cells (right histogram) compared to a negative control cell (left histogram).FITC-conjugated goat-anti-rabbit secondary antibodies were used for the analysis. Western blot analysis of Caspase-5 expression in HL-60 (1), HeLa (2), NIH/3T3 (3) and PC12 (4) using AM26609AF-N.
Western blot analysis of Caspase 5 p10 expression in Jurkat (A); mouse liver (B); rat liver (C) whole cell lysates. Western blot analysis of Caspase 5 p20 expression in MCF7 (A); mouse kidney (B); rat liver (C) whole cell lysates. Western blot analysis of Caspase-5 in Ramos cells with Caspase-5 antibody at (A) 0.5, (B) 1, and (C) 2 µg/ml. 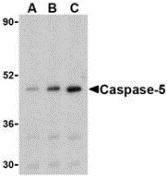 Western blot analysis of caspase-5 in Ramos cells with caspase-5 antibody at (A) 0.5, (B) 1, and (C) 2 ug/mL. 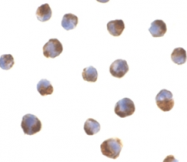 Immunocytochemistry of caspase-5 in P815 cells with caspase-5 antibody at 2 ug/mL. Immunofluorescence of Caspase-5 in P815 cells with Caspase-5 antibody at 2 ug/mL. Western blot analysis of extracts from HeLa cells and A549 cells, treated with etoposide (25uM, 24hours), using CASP5 (p20, Cleaved-Asp121) antibody.The lane on the right is treated with the synthesized peptide. 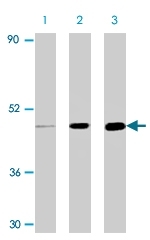 Western blot analysis of extracts from 293 cells, treated with etoposide (25uM, 1hour), using CASP5 (p10, Cleaved-Ser331) antibody.The lane on the right is treated with the synthesized peptide. 17 products - FILTER YOUR RESULTS!